CMC often encounters situations where failure modes predicted by a Customer’s finite element model fail to correlate with the physical analysis data generated by our laboratory. Many times, the root cause of a failure is difficult to determine since the failure itself has destroyed important evidence of the contributing factors. In those cases, CMC has the capability to recreate most of the conditions of failure, applying the appropriate environmental, electrical, and/or physical stressing to the component or assembly. In so doing, CMC can progressively or cyclically evaluate the system to failure. A Customer was experiencing wire bond failures in an assembly utilizing an optical encapsulant to encase the die and associated bond wires. The observed failure mode was not predicted or explained by the thermo-mechanical FE model developed for the system. It became evident that direct observation of an encapsulated bond wire, during thermal cycling and in situ, would be instrumental in understanding the mechanism of failure. 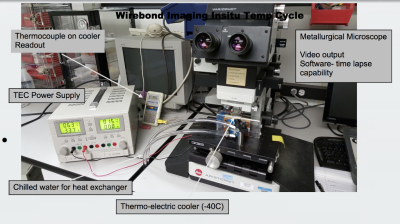 An apparatus was fabricated in house, allowing for thermal cycling from -40C to +160C, while at the same time enabling direct microscopic observation and documentation by digital photography. The imaging system created videos of the wire motion as a function of temperature. The directly-observed motion was not only consistent with the mysterious failure mode, but provided insight for an improved FE model. CMC Laboratories is a LabVIEW certified architect company that provides software programing solutions for custom designed automated test equipment. These are custom solutions for clients that are developed at CMC to measure and/or test very specific parameters of a system. Often solutions are scaled and transfered to clients for integration into thier production line and/or qaulity testing systems. - One of CMC's strategic customers needed a fully automated adhesion testor for use at thier manufacturing site. The major requirement for the testor was the ability to measure forces in the milligram range. The system CMC developed used a LabVIEW interface and automated control stage which applies a fixed pre-load to the sample surface and then measure adhesive tackiness as the stage drops away. Real time high speed data colllection is key to understanding the dynamics of any system while being tested. It often gives insight into problems not only at the point of failure but the events leading up to the failure as well as the events that follow a failure. 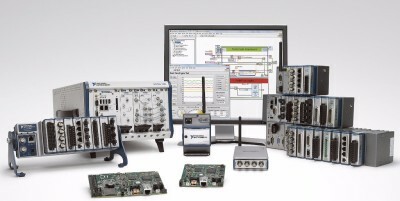 CMC Laboratories can provide custom turnkey high-speed automated test hardware designs using the latest National Instruments systems while providing intigrated software solutions. - Development and licencing of a low volume high precision plating process for military co-fired AlN parts using a combination of electroless and electrolitic Ni and Au baths. 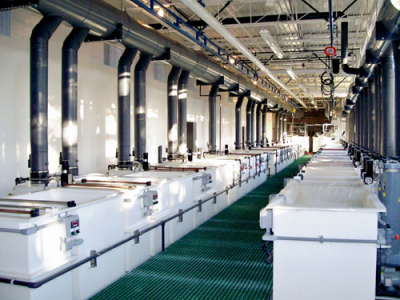 - For a customer in China CMC layedout and designed, developed processes, and implimented a complete manufacturing plating line made up of electroless and electrolitic Cu, Ni, Au, Zn, baths along with activation tanks and rinse lines. - For a US medical device company CMC developed a custom substrate scrap re-claim process for a "highly valuable and expensive" medical image sensor . CMC's process was able to bring the substrates to a factory new condition allowing the client to reuse otherwise scrapped components. Saving the client ~2 million a year. CMC's customer was manufacturing a unique medical fixturing device. For quality control, they need to be able to characterize the flexural strength of this tool under very specific loading conditions. CMC built a customer tensile tester which would load the sample per the customer's requirement and measure displacement vs. force. This tool was transferred to the customer and used in quality control. 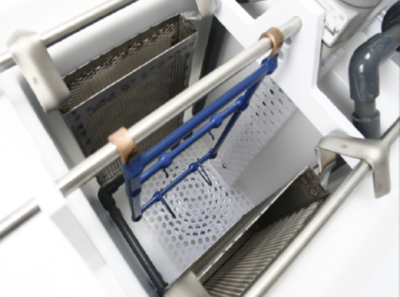 CMC's customer build a specialized device for a mil-aerospace application. They required a high volume of electrical measurements to be made on this device while undergoing stress in a highly non-standard application. This was used as a production screening test. CMC build a specialized environmental test chamber and set up automated electrical test for this device. This test was done at CMC's Tempe facility. ​ CMC's customer was seeing a wirebond failure in a complex encapsulated package that was not predicted by a Finite Element Model. To understand this failure mode, CMC set up a optical imaging system in an environmental chamber that could be cycled from -40 to +160C. The imaging system created videos of the wire motion vs. temperature. This motion could then be connected to the specific aspects of the package which were leading to this wirebond cycle failure. An example of this video output is shown on the link on the right. This whole non-standard set-up was customized a customer specific problem. CMC's customer needed a specialized adhesion tester that could measure contact adhesion forces in the milligram range as a quality control tool. CMC build a customized adhesion tester that utilized the load cell from a micro-balance and used a lab-view program to control and actuator which contacted the sample with a fixed force and then measure the load vs. displacement as the actuator was pulled away from the sample. This tool was built on a stable frame, computer interfaced with Labview and moved to the customer's manufacturing site. CMC's customer developed a proprietary coating technology and needed to evaluate how contact resistance changed with wear cycles. CMC built a wear-tester customized around our customers application. This tester was automated with LabView, which controlled the probe location, sylus speed, stylus stroke as well as data collection. CMC then utilized our Analysis Laboratory to understand the fundamental wear mechanisms that were demonstrated in this custom test set up. CMC was able to assembly this custom test in 4 days, including building the test structure, programming motors, setting up the electrical test and automating the data collection. CMC Laboratories has a dedicated plating development facility and over 35 years of combined plating process experience in developing and licencing electroless and electrolytic plating processing. This includings plating Au, Au-Co, Ni-P, Ni-B, Ni-Co, Cu, Pt, Pd, Ir, Rh, and more. CMC also leverages its chemcial development background to develop processes for cleaning and reclaim. Development and licencing of a low volume high precision plating process for military co-fired AlN parts using a combination of electroless and electrolitic Ni and Au baths. For a customer in China: design, specification, layout, and implimentation of a complete manufacturing plating line made up of electroless and electrolytic Cu, Ni, Au, Zn, baths along with activation tanks and rinse lines. For a medical analytical company in US: development of a custom substrate scrap re-claim process for a "highly valuable and expensive" medical image sensor . CMC's process was able to bring the substrates to a factory new condition allowing the client to reuse otherwise scrapped components. This resulted in a very large savings. - Development and licencing of a low volume high precision plating process for military co-fired AlN parts using a combination of electroless and electrolitic Ni and Au baths. Also we have developed processes for plating Ni-P and Au on LTCC with Ag metallization. Cu, Ni, Au, Zn, baths along with activation tanks and rinse lines. - Development of a custom substrate scrap re-claim process for a "highly valuable and expensive" medical image sensor . CMC's process was able to bring the substrates to a factory new condition allowing the client to reuse otherwise scrapped components. This saved the client ~2 million a year.